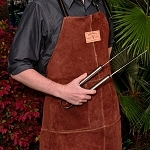 Protect yourself in style with our Personalized leather BBQ Apron! These heavy-duty aprons will make any backyard BBQer look the part of pitmaster. 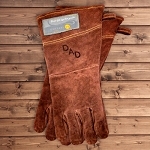 Feel comfortable and confident with these exclusive personalized BBQ grilling gloves! Made of durable leather with a suede finish, it’s the perfect gift for the dedicated grill master!